Marry knowing that it is for love and not money. This ante-nuptial agreement (also known as a pre-nuptial agreement allows you to plan how you will divide your current and future wealth between you and your husband, wife or partner should you decide to divorce or separate in the future. It will help you control your ownership of important assets such as your house, sentimental possessions and your business. 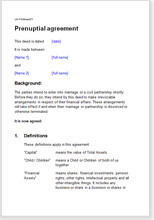 See antenuptial agreement: protection of property.